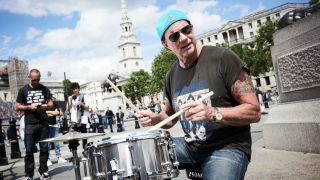 Win two tickets to an intimate Chad Smith Masterclass at ACM London! The Academy of Contemporary Music (ACM) is extremely excited to be hosting an exclusive London masterclass with Red Hot Chili Peppers drummer, Chad Smith, at their brand new facility, in partnership with Rhythm Magazine. And YOU could be there. Held at ACM London in the heart of Clapham on the 7th December, this unmissable session will give lucky attendees the opportunity to take part in a no-holds-barred Q&A and clinic with the legendary drummer, after catching an intimate live performance. ACM prides itself on bringing in the best of the industry to masterclass sessions exclusively for its students. On this rare occasion, ACM is teaming up with Rhythm Magazine to open its doors and offer two lucky readers a chance to experience the masterclass with ACM patron Chad Smith. For a chance to win one of two tickets, head over to our competition page now.